With special recognition to the Fraternal Order of Eagles, Indiana State Aerie & Friends for their gift and support of this pediatric hearing center. The ENT Center and Pediatric Communications Center provides a full range of audiology services from testing, non-surgical and surgical interventions (cochlear implants, bone-anchored hearing aids) to family-centered education. Our certified pediatric audiologists have extensive experience working with children of all ages. We specialize in best-in-care practices for the hearing impaired with a family-centered approach. Our ongoing care and support continues as your child grows and includes the coordination of related services such as speech therapy. Every 36 hours a baby with hearing loss is born. Majority of children (92%) with permanent hearing loss are born to parents with normal hearing. 2-3 per 1,000 children at birth are diagnosed with hearing loss bilaterally. To learn more see – Signs of hearing loss in children below. Often parents and caregivers are the first to notice a hearing problem. Hearing loss can start at birth or develop throughout childhood. 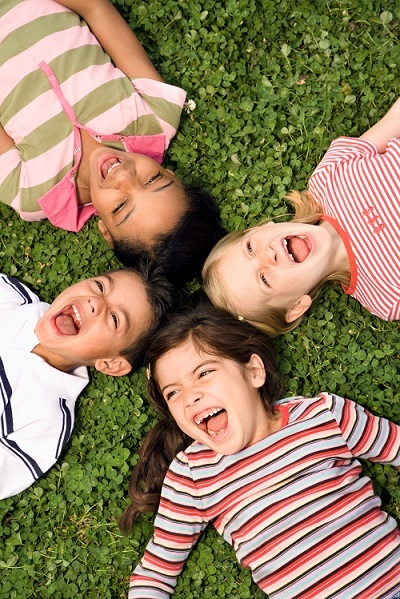 The critical period of speech and language development is from birth to 3 years of age. If you suspect a hearing problem, contact your physician, or call the St. Vincent Pediatric Communications Center directly. Our pediatric ENTs and audiologists are professional yet approachable. As a team, we are focused on the importance of hearing and the impact it has on a child’s communication, learning development, social skills, and vocational choices. The 1-3-6 month approach is recommended by the Indiana State Department of Health, Early Hearing, Detection and Intervention (EHDI) https://secure.in.gov/isdh/26082.htm In 2000, Indiana was one of the first states to mandate universal newborn hearing screenings, and we continue to be a leader in maintaining early identification and follow-up rates. 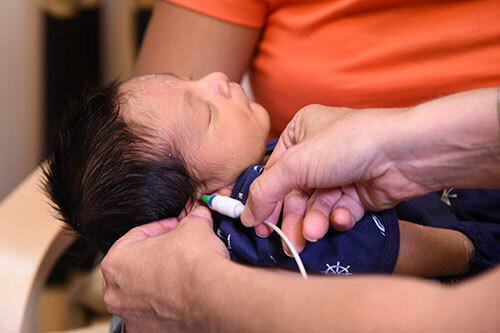 Best practice mandates that every child who does not pass this newborn hearing screening test should be seen for a diagnostic hearing evaluation. By 3 months old — Diagnostic auditory brainstem response (ABR)– this is a diagnostic tool for measuring hearing when more conventional hearing tests cannot be used. To schedule hearing testing, call the Pediatric Communications Center at 317-338-6815. Throughout the testing sequence, we provide families with educational resources and will send results to your primary care physician. Behavioral audiometry – This subjective behavioral test is used to detect the softest level at which a child can hear across different frequencies and to speech. Extended high-frequency audiometry – A subjective test used to monitor the hearing status of children who have been exposed to potentially ototoxic medications such as chemotherapy. Otoacoustic emissions testing –This objective test measures sounds to the level of the hearing organ, the cochlea. Tympanometry – This objective test is used to determine the status of the middle ear. There are several types of hearing aid options available to families that may be recommended by the audiologist based on the degree, type and configuration of the hearing loss. These include traditional behind-the-ear hearing aids, bone-anchored hearing aids (BAHA), and cochlear implants. Behind-the-ear hearing aids are commonly recommended for most hearing losses. Following an appropriate diagnostic evaluation, hearing aids will be fit as young as infancy. This device allows stimulation via bone conduction to the inner ear for patients with conductive hearing loss or single-sided deafness. Although the surgical approach is recommended for children over five years of age, a non-surgical option is available for younger children. Children who are candidates for a cochlear implant will receive a surgically implanted electrode array that is inserted into the cochlea as an external device. The internal and external devices working together send electrical current to the hearing nerve. Through this program and generous donations from Psi Iota Xi, our audiologists also help children and families navigate the financial aspects of acquiring the hearing aid device. Amplification for a trial period of 3 months prior to cochlear implant surgery which is required by insurance. Amplification for patients while their personal hearing aids are off for repair/cleaning so that the child is never without sound.